5 Mountain biking and hiking maps in Strathspey. 5 Maps around Aviemore in The Cairngorms National Park. The countryside around Aviemore is perfect for both mountain biking and hiking. This area is part of the Cairngorms National Park and there is something for everyone. There are easy hiking trails on flat terrain or hard climbs and fast descents for the mountain bike expert. On a mountainbike ride or hike, you will see magnificent views of lochs and burns, ancient Caledonian pine forest and the Cairngorms Mountains. Try some of the suggested routes or just adventure on your own, using these maps and routes as a guide. Getting There All five areas in the Strathspey series of trail maps are located within 15 miles of Aviemore. Situated in the heart of the Spey Valley in the Cairngorms National Park, Aviemore has excellent transport links including regular bus and train services from both central Scotland and Inverness. Map 1 - From Aviemore to Glenmore this map covers some of the best and most popular trails in Strathspey. Three suggested routes are described in detail, including an easy circuit near Loch Morlich and another slightly harder one past Badaguish. Without doubt the best trail in the area runs from Inverdruie to Loch an Eilein and through the Rothiemurchus Estate to Glenmore. This is clearly marked on the map, with a written description giving a choice of 3 different ways back to Inverdruie. Map 2 - This map covers an area south and east of Aviemore including Glen Feshie and Gleann Einich. Two straight forward routes are described from Feshiebridge through Inshriach Forest and Glen Feshie. A 3rd route describes a long walk or ride into the remote and spectacular Gleann Einich. This should only be attempted by the fit and well equipped. 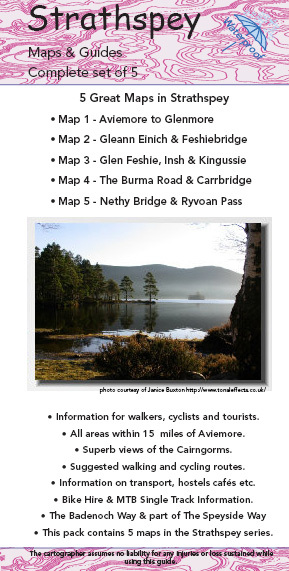 Map 3 - This area around Glen Feshie and Inshriach Forest is ideal for walking and biking. Two great routes are described from Feshiebridge though Inshriach Forest passing close to the picturesque Uath Lochan. A longer route through Glen Feshie will take you into this quiet, remote glen. There are magnificent views of the Cairngorms and River Feshie and if you are lucky you will see Golden Eagles and Ospreys. Map 4 - This map covers the area north and west of Aviemore and includes the classic Burma Road Track in the Monadhliath Mountains. A route is described and clearly marked on the map from Aviemore via the Burma Road and Dulnain to Carrbridge. An easy route is suggested running north of Aviemore along The Speyside Way towards Boat of Garten. Finally a route is described from Carrbridge to The Slochd and the historic Sluggan Bridge.